Original Terrazzo Floors Shine In The Circular Lobby, Graced By A Carved Italian Marble And Mahogany Reception Desk. Harry’s Grille Is Located Off The Lobby And Serves Eclectic Cuisine For Breakfast And Dinner. The Oceanfront Aquatica Presents A Festive Menu For Lunch And Dinner Daily. More Than 43,000 Square Feet Of Function Space Is Available, And The Hotel Offers Event Catering And A Full-service Business Center. Beach Attendants Are Eager To Pamper Guests On The 600 Feet Of White-sand Beach, Which Is Dotted With Covered Beach Lounges. Personal Cabanas Line The Garden Terrace, And Two Outdoor Pools Are Surrounded By Swaying Palm Trees. The Fitness Club Includes Cardiovascular And Weight Equipment, A 16-Channel Personal Audio/Visual System And Daily Aerobics, Spinning And Boxing Classes. The Spa Of Eden Pampers With Treatments, Including Citrus, Milk & Honey Revitalizer And Hydrating Body Thermal Cocoons, Such As The Papaya Mango Body Smoothie. Most Of The 349 Guestrooms At The Eden Roc Miami Beach Renaissance Resort and Spa Feature Sitting Areas, Balconies With Ocean Views And Walk-in Closets. Cable Television, In-room Safes And Coffeemakers Come Standard In Each Room. Bathrooms Display Italian Marble. Expert Tip. Designed By Famed Art-deco Architect Morris Lapidus In 1956, The Hotel Has Attracted Many Celebrities. 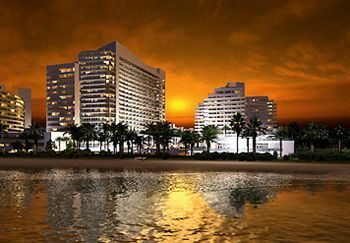 Click Here For Special Offers At The Eden Roc Miami Beach, A Renaissance Resort and Spa!